The 1 Bedroom 1 Bath Gulf Front unit has been recently renovated. This unit has a comfortable king size Bed with a Pillow Top Mattress. The unit has a walk in tiled shower. There is a full size range, microwave, full size fridge, coffee maker, toaster etc. There are 2 TVs with cable. The unit is on the 2nd floor facing the beach. This unit does have a balcony right outside of the unit that you are able to sit on. The views and sunsets are beautiful from the living room. 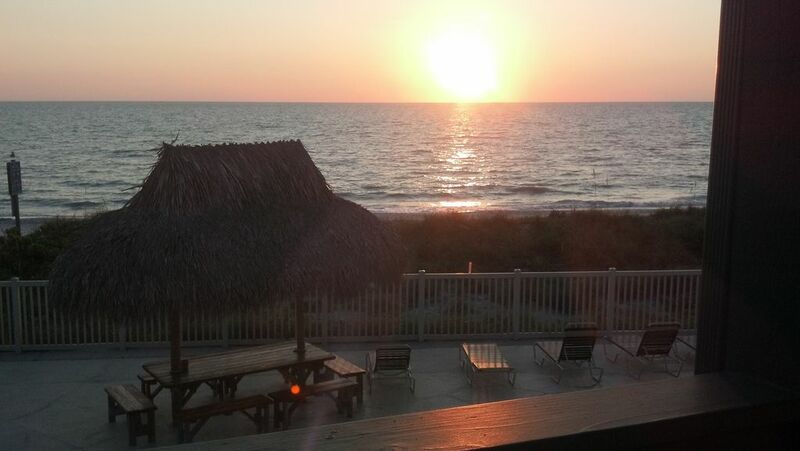 Enjoy waking up and going to bed with the tranquility and sounds of the beach right out your door. This is said to be one of the most beautiful beaches on the West Coast. Since this is a small complex, it feels like a private beach cottage. This unit also has wireless internet for your convenience. Chateau's Features: Beautiful 1 bedroom 1 bath gulf front condo that has been recently updated with a brand new kitchen, bath, furniture (including new king size bed) 2 TVs with cable, and much more. The unit has direct beach and water views. The complex is small, quiet and very friendly. There is a washer/dryer located on site. The condo is conveniently located to stores, theaters, water sports, theme parks and it is only 2 miles from downtown Clearwater Beach. I am originally from the Chicago area, and I grew up in a large family with 7 Brothers & Sisters. I came to this area with a girlfriend in 1990 and by 1991 I had purchased my first condo in the Clearwater area. I didn't plan on renting, until one day when one of my sisters brought someone up from the pool to see my unit. She was very interested in renting, and I thought why not. By the next year I had purchased another unit and on and on. I would have to say, that this is one of the smallest units I have owned, but one of the favorites of my tenants. Most people love the quaint feeling of the smaller complex. They can just walk out of the unit and to the beach, which is not possible in some of the larger complexes. My trips to the area started to get longer & longer, as it was difficult to leave the area. I have great memories of all the times spent with family & friends. I know that there are a lot of properties to choose from, so it can make for a difficult decision. I purchased this property, because I loved being right on the beach. You will feel like you are at a beach house, rather than a condo. I have had many other units on the beach, but they were in high rise buildings. The other properties were nice, but you could not just walk out to the beach from those units. It made it more difficult to come and go, since you always had to take the elevator. I also love the friendly feeling of the smaller quaint complex. The people at the complex, all make you feel so at home, and many look forward to returning year after year. Full Size Kitchen, 2 TV's with cable, wifi, king size bed with pillow top mattress, walk in tiled shower and incredible views of the beach, gulf of Mexico and amazing sunsets right from this unit. I also try to listen to what a persons needs are, and if I do not feel my condo is right for them, I will tell them so. My goal is to make people happy, and hopefully I will be able to help them year after year. I make sure that things are constantly updated in the unit. I also make sure that if there is something they need in the unit, I make every effort to get it to them. Walk right out of your unit and step onto the Beautiful Sandy Beach and collect Shells or take a swim in the Gulf of Mexico. Directly on the Beach! You will not find a condo closer than this one is to the Gulf of Mexico. This unit is Direct Beach Front with Beautiful views of the Gulf of Mexico, Beach and the most Amazing Sunsets. Direct Gulf Front balcony right outside of this unit that faces the beach and the Gulf of Mexico. There is plenty of room on this balcony to sit and enjoy the beautiful beach and water views. Deck area surrounds the pool area which faces the Gulf of Mexico. This area also offers covered table and chairs, as well as chaise lounges. Beautifully decorated, steps to the private beach, reasonably priced. The owner was very prompt at getting all the details to us and the condo was very clean and updated! Perfect location close to everything but yet quiet and at times we had the ocean to ourselves! I even saw dolphins one morning swimming right out from us! Will definitely be back! Thank you so much for making our vacation so special! Everything was fine until the A/C was not cooling, we had to remove the filter and wash it. Was clogged in filth. Also I happened to look underneath the bed and SURPRISE!!! Like an inch of dust, debris and used toilet tissue? Nasty. I saw and killed small roaches in the bathroom and big ones in the bedroom area. That's not counting a lizard was in the unit, disgusting. I notified the owner the day we left because we didn't want anybody in there while we enjoy our vacation, plus my sister is recovering from an struck. They charge cleaning fee and only "clean" around. The location is perfect. Owner only apologized. In response to my guest......I was not notified of any issues until the day they were checking out. If I had been notified at the time the issue occured, I would have resolved all issues immediately! I've had numerous units over the past 25 years, and I have always taken great pride in making sure that everything has been in excellent order for my guests! In conclusion: A home owner can only resolve an issue when it is brought to their attention. I feel that this was a very unfair review, based on my guest not giving me the opportunity to resolve their issues! My guests final response to me was, "Anyway, the rest was great"! Just one word. Incredible! Enjoyed every aspect of our stay. Room was perfect for two persons. My daughter and I had a great timeon Bellaire beach. Perfectly located between Sarasota and Clearwater, it had wonderful beach access and a pool for guests. Clean room. I recommend it highly. We will visit here again. Clean and well kept. Great communication from owner and easy processes. We love this place and ‘our’ little piece of the beach/ocean. This was our third year at this location, second year at this specific unit, and will come back in a heartbeat if we can! My wife and I spent 7 days in this one bedroom Condo overlooking the Belleair Beaches. The Condo was very clean and stocked with all the basic supplies (fresh linens, towels, toilet paper and paper towels). We received the Condo key in the mail about a week before we arrived and that worked out great. The Condo had 2 TV's and good internet access. The Condo had beach chairs and even an umbrella for our use. The Condo Complex had several small charcoal BBQ units and even provided the charcoal and lighter fluid. Although we did not use it, the complex also had a 2 person kayak that we could have used. The pool was great too. As shown in the pictures of the second floor unit, this Condo complex did not have a private balcony but did have a gulf view balcony that you could use by just walking out your Condo door and lean against the railing to watch the sunsets. Over all, I would recommend this unit for 1 or 2 people wanting to be on the beach for a few days. Also the use of VRBO was very convenient and efficient.